This Sunday I will be leading a pre-emptive tour of some of the most promising cycle infrastructure currently under development in London. It's pre-emptive because much of it is not yet finished. Therefore it won't be as particularly pleasant ride because in parts we will have to cycle outside not-yet-open cycle lanes tussling with the motor traffic. However, I think it is worth seeing what is going on and assessing it at this stage. Some of the infrastructure is open and can already be enjoyed. If you'd like to join somewhere else on the route described below, tell me and I'll see if it can be arranged. Under-construction segregated cycle tracks. Larger map here. This map shows approximately (not exactly) the recently-completed and under construction segregated cycle tracks in London. It also shows the location of Brent's not-yet-approved Carlton Vale scheme. This was the starting concept for planning the ride, to take in as many of these locations as possible. (But starting from the north-west suburbs, it proved necessary to leave out Cycle Superhighway 3 and the east part of the East-West Superhighway). 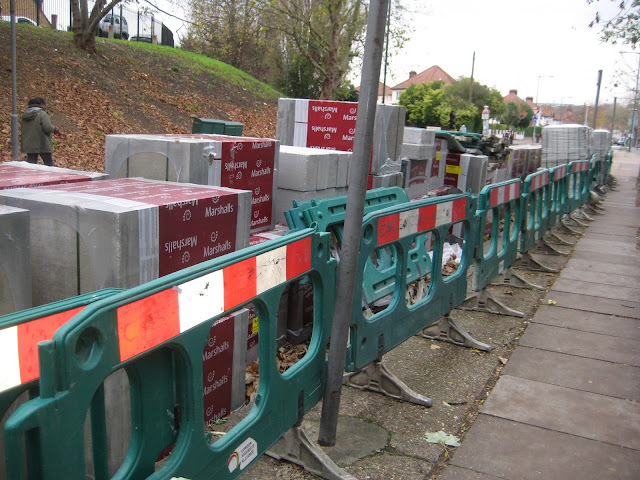 There's no infrastructure to speak of on the ride before reaching Queens Park, though just past Gladstone Park a pile of stuff is encountered in Park Avenue North, which I suspect is the first sign of construction of Quietway 3 in Brent. Quietway 3 will run from Regent's Park to Gladstone Park in its first phase, with hopefully an extension across the north Circular towards Wembley and Harrow later (though that will be in the lap of the next Mayor). Near the final pick-up point at Queens Park Station we will pause to have a look at the Brent section of Carlton Vale, with a copy of the plans for semi-segregated cycle tracks that I have in my possession. These have not yet been put to public consultation, so this is a good stage to feed suggestions for improvement back to the Brent Council. 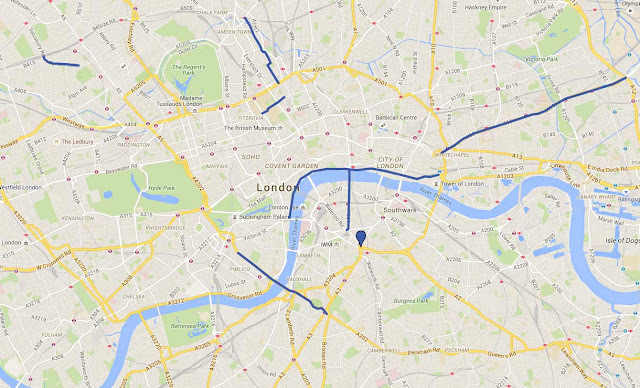 The next objective of the ride is to look at the location of the future East-West Superhighway in Hyde Park. Unfortunately to get there is to try to pass through a terribly bike-impermeably part of London, through the need to cross the Westway, Grand Union Canal and Paddington railway corridor. There is no legal way through here north-south for cyclists between Royal Oak (Lord Hill's Bridge) and the Edgware Road, both of which are most unpleasant roads – a gap of 1km. If the East West Superhighway is extended to the A40, as planned, and if Westminster build their Quietway network, this barrier might one day be surmounted. But it is not clear to me how it will be, or if the planners of the grid have realised what problem this is. The best that we can do on Sunday is to get off and walk. After passing through the pedestrain-only underpass at Porteus Road, we reach the newpedestrain-only bridge across the Grand Union Canal at the Paddington Central development. That such a poor piece of pedestrian infrastructure was created so recently in such an important place is quite shocking. 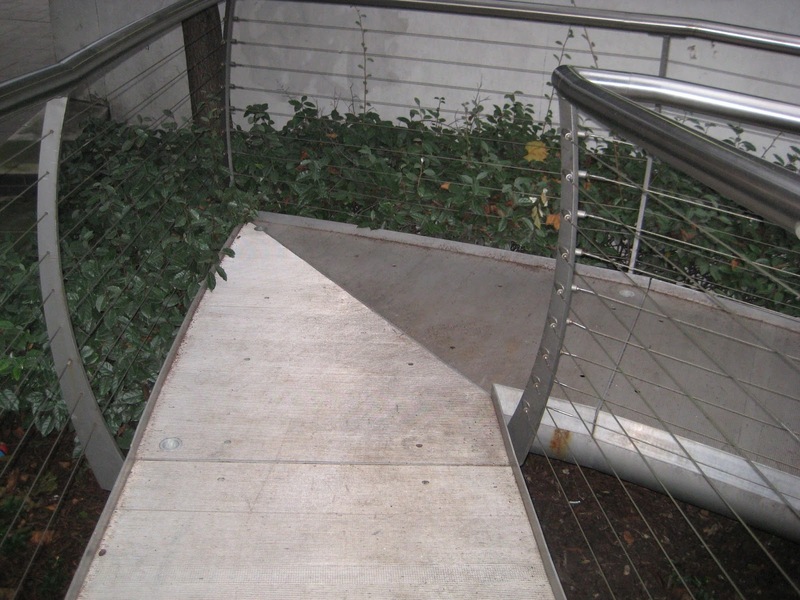 Forget about not being bale to cycle across it: how could a wheelchair user negotiate a corner like this? Proceeding via the pedestrain-only waterside and primitively-cobbled path leading to London Road by Paddington Station, we will cycle to Hyde Park. There we see signs of action. The E-W superhighway will go via the West and South Carriage Drives, which we will follow. This routing is clearly intended to take pressure off the shared (separated) paths Rotten Row and Broad Walk, though I doubt how successful this strategy will be, as Broad Walk and North Carriage Drive will represent a shorter route. We will then follow an old London Cycle Network route, sadly under-engineered, which was originally known as the Ambassadors' Route when created in the early 1980s (it features prominently in this film). 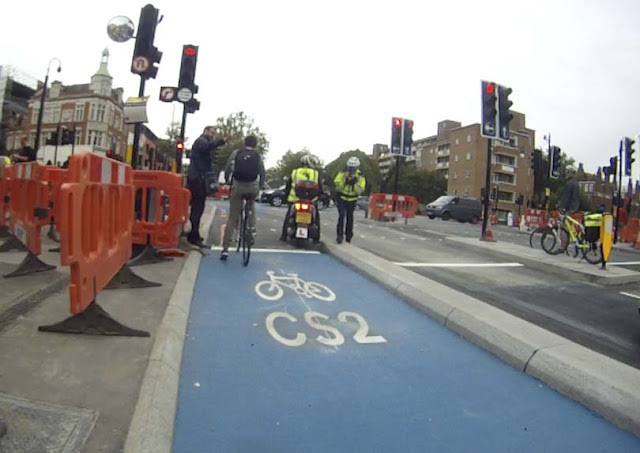 This takes us to Pimloco where we can discover what has been built of the north end of Cycle Superhighway 5 in Vauxhall Bridge Road. This is where things start to get impressive. This sets the pattern for what we will see on the rest of the ride. 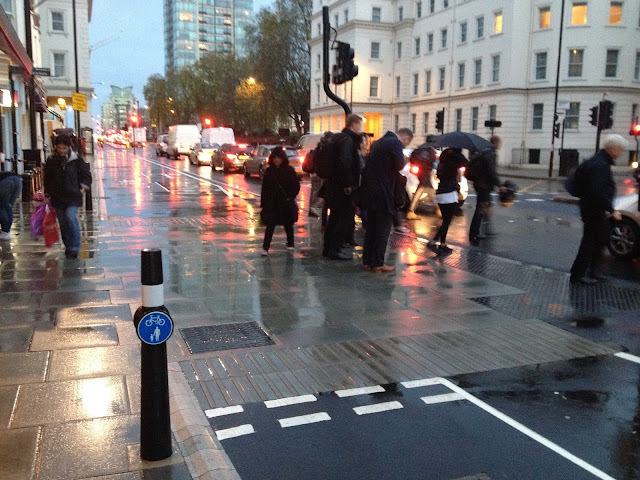 Here we have a 4m wide two-way cycle track separated by low kerbs from both pavement and road, clearly set-out. 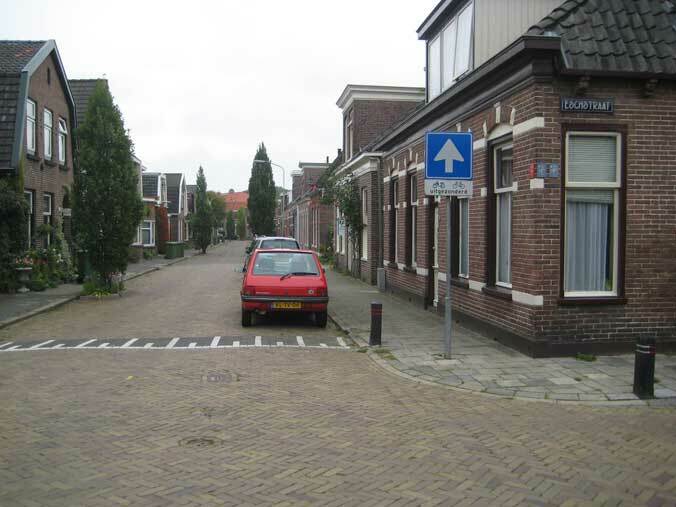 We'll be able to observe how, for example, the pedestrian crossings like this one work. This continues to the crossing of the Thames at Vauxhall Bridge. On the south side of the river the passageway is clear and safe, though not always so wide, through the previously-notorious Vauxhall Gyratory system and under the railway into Waterloo. Segregation continues at the standard shown above to Kennington Oval, whereafter CS 5 reverts to the old-style painted blue blobs. 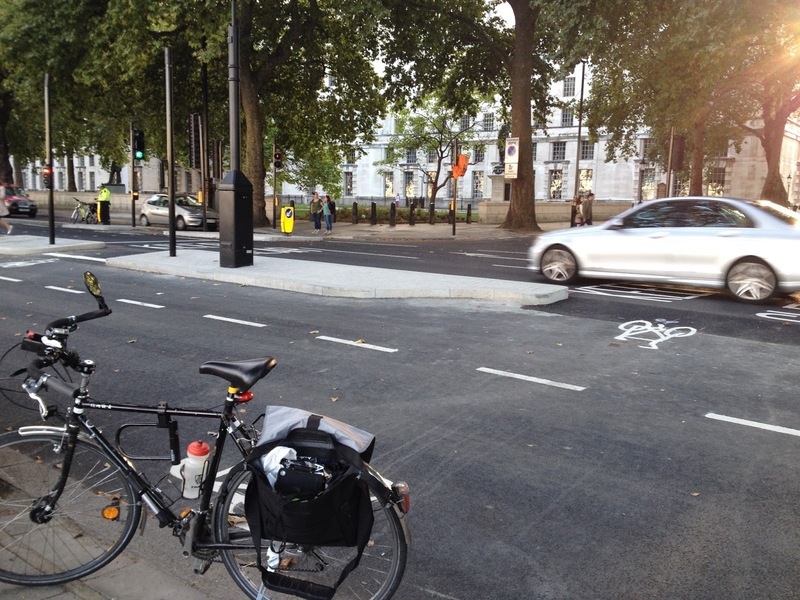 We, however, will turn left to join CS 7 on Kennington Park Road. This is not particularly impressive until one gets near Elephant and Castle, where what appears to be a temporary arrangement takes us, very clearly signposted, through a churchyard and via some minor streets, on to the new CS 6 on St George's Road (previously know as the North-South Superhighway). Though this is not on the most direct route between Elephant and Castle and Blackfriars Road, the cycle track is again impressively implemented. It leads into similar engineering still being built on the west side of Blackfriars Road, via a signalised crossing of the St George's Circus roundabout. We will be able to judge the efficiency of these junctions for cyclists. My impression was that they are good. By this stage in the ride we have already seen probably more of the low-level cycle signals than has anybody else in the UK. These fantastically sensible features have only just been approved for use, and Transport for London are rolling them out on these tracks. The track is not yet constructed on Blackfriars Bridge or the slip road off it, but we can see where it will be. 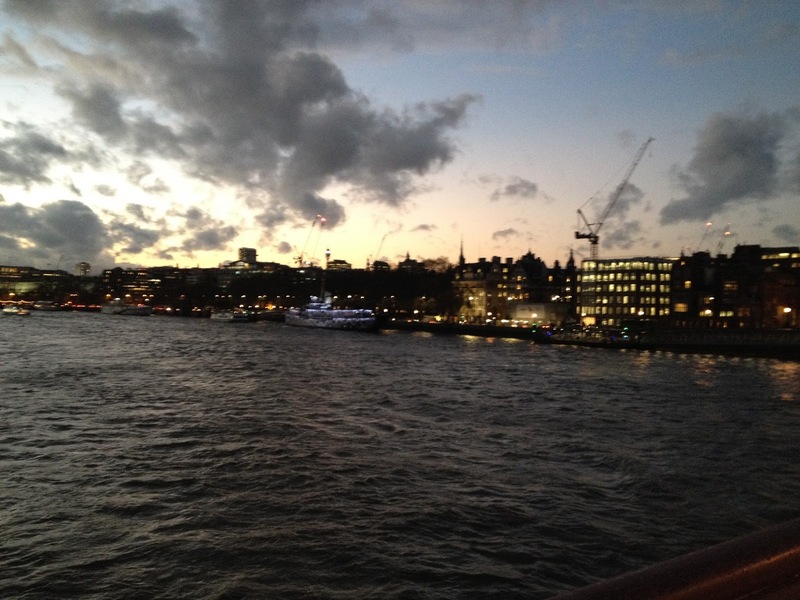 The Thames was looking quite choppy when I took these photos on Wednesday. We will then find, I hope, that we can then cycle a substantial section of the Embankment Superhighway going westwards that is not yet officially open. 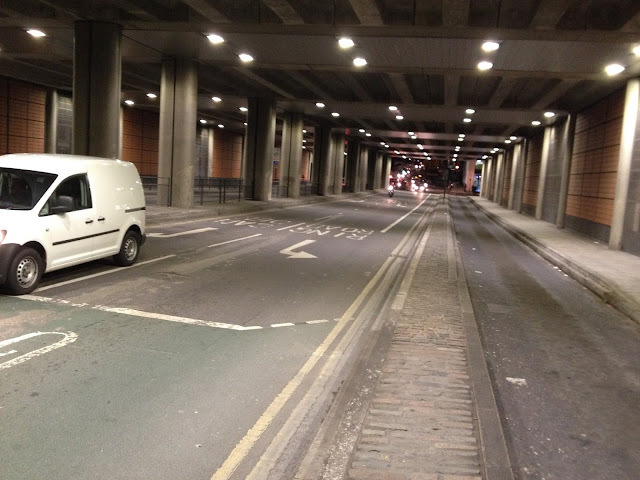 Here are the works between Blackfriars and Waterloo Bridges. 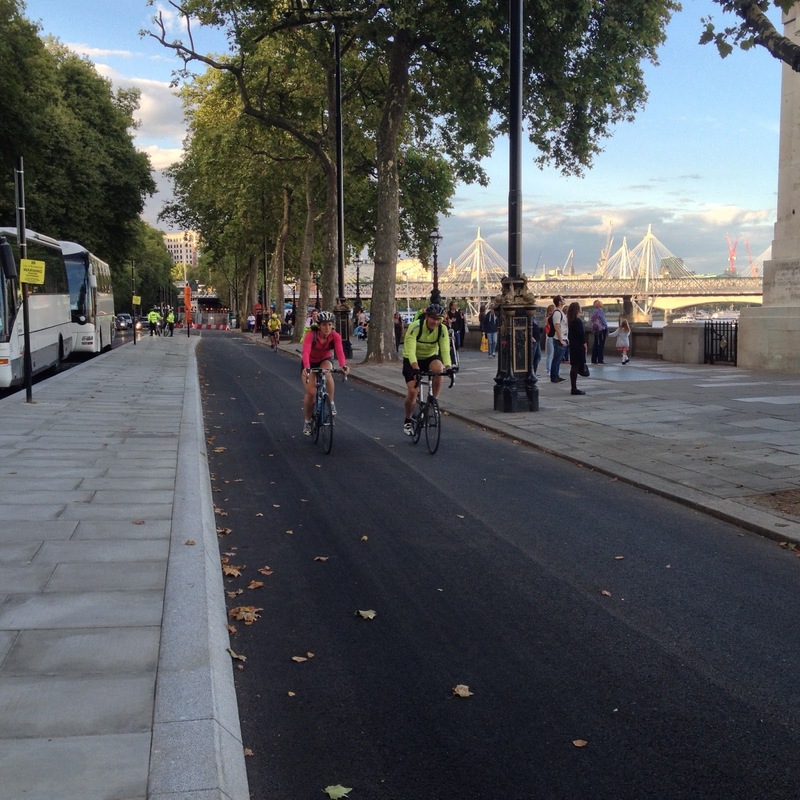 And here is the section already in use, approaching Westminster Bridge, with the wide segregating island designed so that coach parties can congregate on it without spilling into the track, and chamfered kerb to minimise the chance of pedal-strike. This has already become an 'iconic' view of London, to those of us of a kerb-nerd disposition. 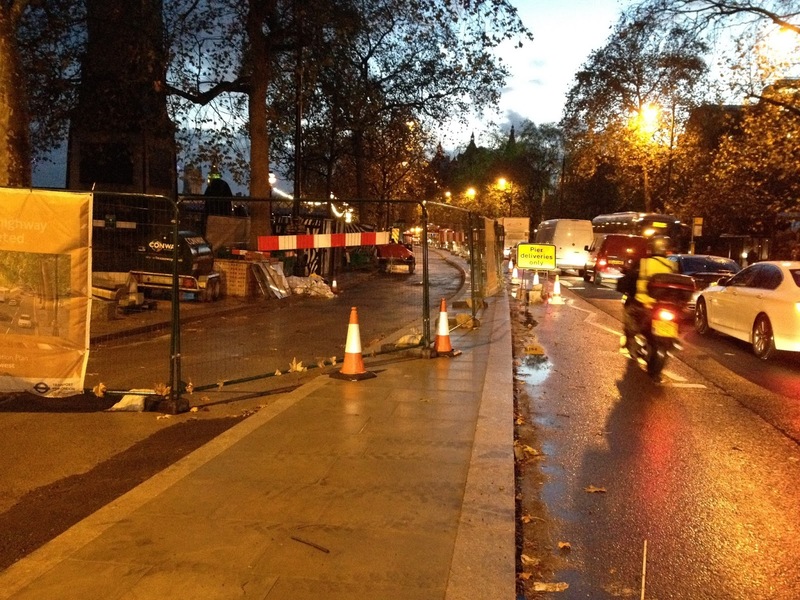 Parliament Square is as awful as always; work on the cycle crossings here has not yet started. We will head up now through the West End, as best we can, showing where is another of the serious gaps in the infrastructure that is in the City of Westminster's court to solve. Charing Cross Road is a disaster-area that desperately needs complete re-planning including Space for Cycling, or most of the traffic removed. 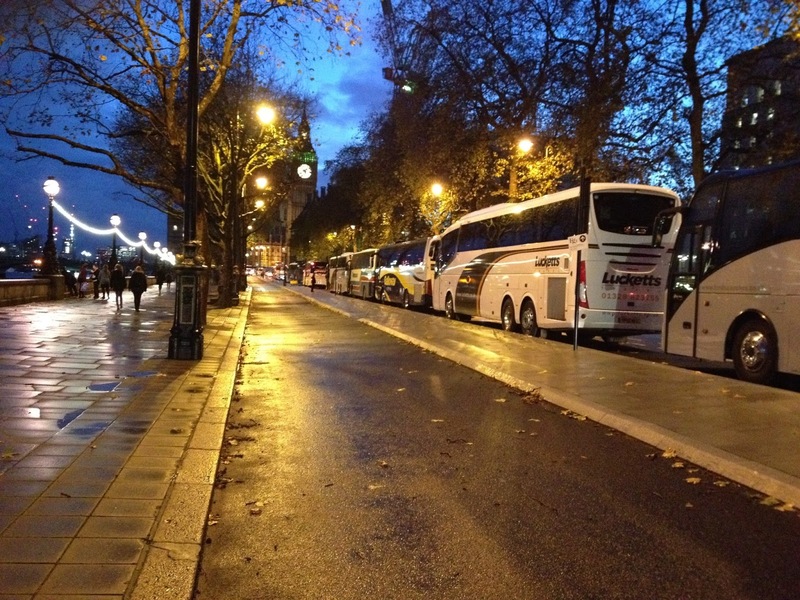 It is a disaster equally for those on bikes as those stuck in the permanent queues in buses and taxis. It just doesn't work as it is. We reach more civilised territory as soon as we cross the border into Camden. The Borough of Camden deserves huge credit for, over the last twenty years, rationally re-planning and upgrading its traffic network, particularly in the south of the borough, with an emphasis on removing unnecessary traffic from residential (and some business) neighbourhoods, and facilitating cycling. 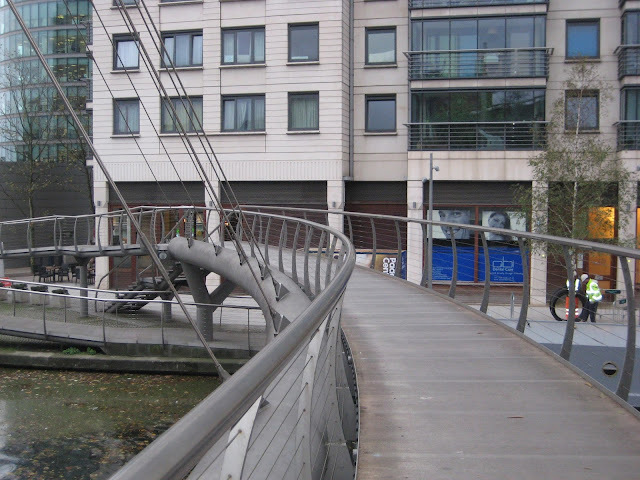 I have covered the history of Camden's cycle network extensively on this blog. Particularly deserving of credit is the Camden Cabinet Member for the Environment, their roads supremo, Councillor Phil Jones, who has lead a serious expansion of the segregated cycle network in the borough (which was already the only one deserving the name in London), using the money made available by Transport for London under Mayor Boris Johnson's cycling programme, and, particularly, has bitten the bullet and ordered the doubling of capacity of the east-west segregated cycle link through Bloomsbury (the old London Cycle Network route 0, or the Seven Stations link), so brining to the originally-intended standard the link planned and lobbied for by Paul Gannon, Paul Gasson, myself, and other members of Camden Cycling Campaign in the early 2000s. I need also to mention that the current members of CCC have campaigned energetically for this outcome. We will see on our ride how this work is progressing. The original two-way cycle track on the north side of the road is being converted to a one-way track eastbound within the same width, and a new westbound track is being constructed using semi-segregating Orcas (already used in Waltham Forest and planned for use on Carlton Vale in Brent). Hence the cycle capacity of this incredibly popular link is being doubled, through a whole lane of motor traffic being removed and the whole of the corridor being converted to one-way operation for motor traffic. 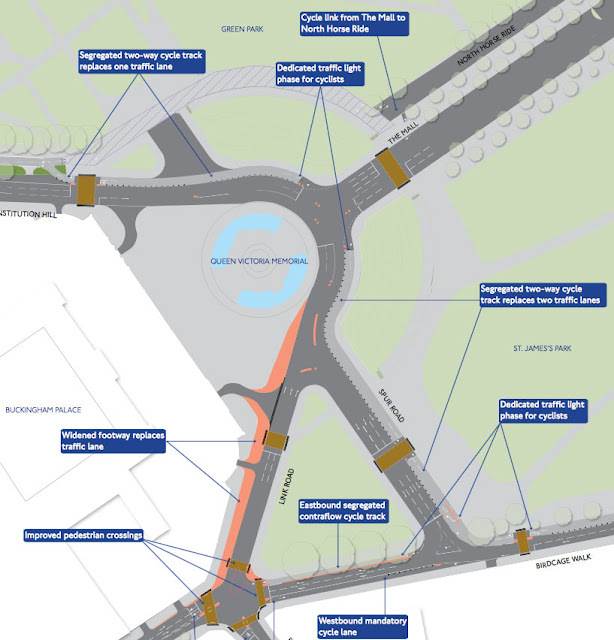 Moreover, the motor flows are being opposed on opposite sides of Gower Street, so removing the corridor as a rat-run alternative to Euston Road entirely. This is exactly how the Dutch so frequently use one-way working for motors in dense city centres to eliminate through traffic, and it is great to see a London borough applying this concept. The reduction in traffic on the corridor and simplification of the whole system should remove the junction problems that have existed on this route in its previous layout. The separation of the eastbound and westbound flows of cyclists will remove the risk of cycle-cycle collisions in the old confined space. Pedestrian facilities are being improved as well. It's a win all round. If you like the scheme when you have tried it, tweet about it with #taviplace or send an e-mail to Camden Council: torringtontavistocktrial@camden.gov.uk to help ensure that the supporting voices outweigh those of the objectors – who will undoubtedly be many. ‘Winning the peace’ also entails all who use the new scheme riding legally and courteously so as to maintain the respect of local residents. 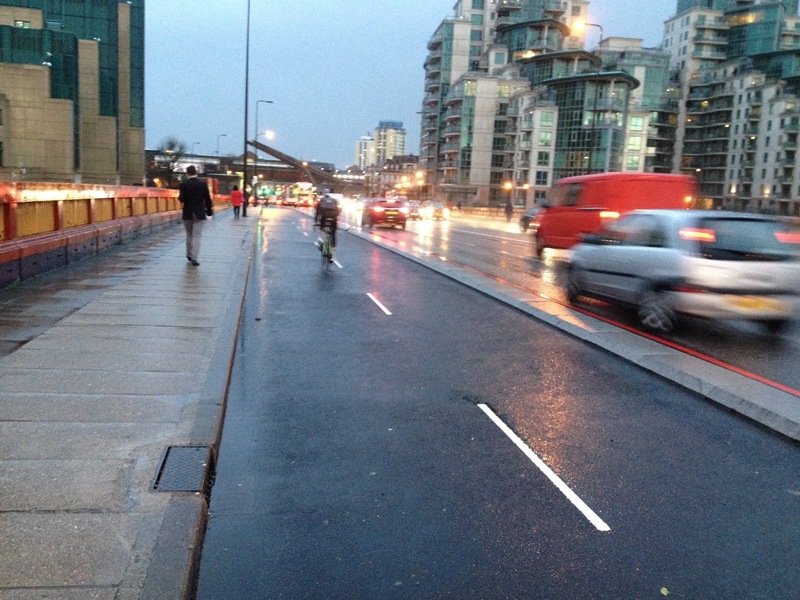 Not everything Camden has done for cyclists in recent years has been quite so clever. After experiencing this (unfinished) project we head up to Kings Cross and St Pancras, and one curious thing we experience is the Pancras Road tunnel under the railway (below) where the cycle lane is the bit bewtween the solid white line and the segregating island, coming into collision with the left-turning stream of traffic. The bit between the segregating island and the pavement is... wait for it... a taxi lane! 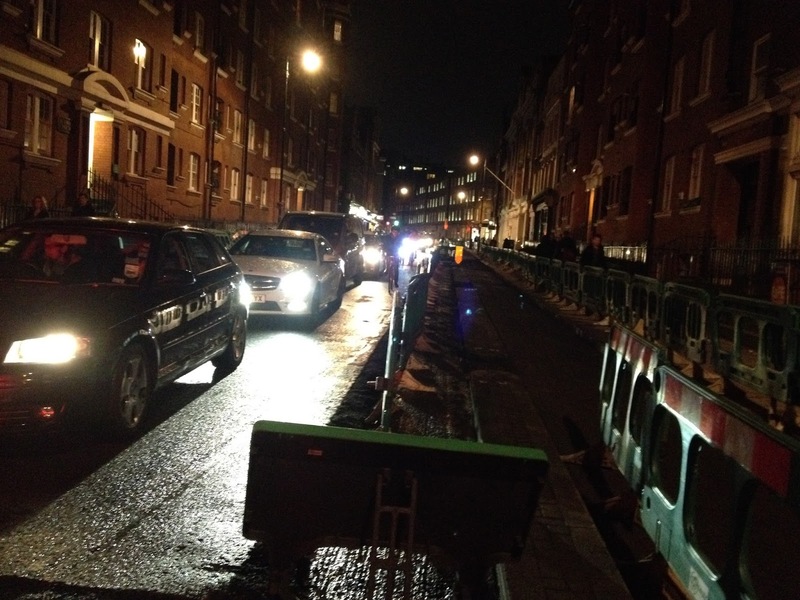 And the taxi drivers have the nerve to be ungrateful to Camden now over Tavistock Place! 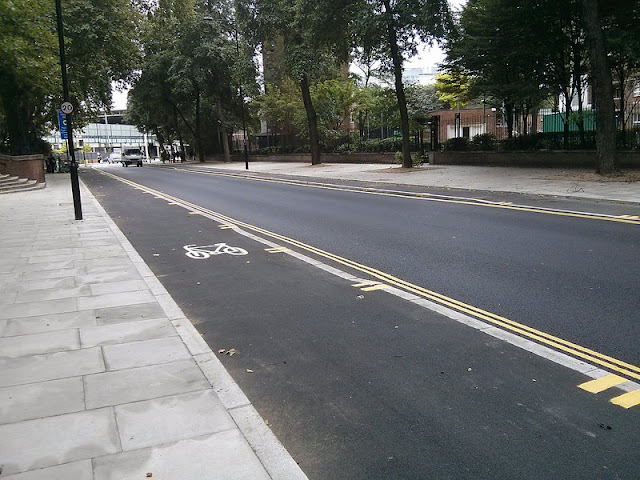 In the northern part of Pancras Road Camden are doing better, with new stepped cycle tracks, which we will also experience, before finding our way to the northbound Royal College Street cycle track, which has had some subtle improvements since I last posted about it when first it opened. We will then follow the route along Pratt Street and Delancey Street that will be going ahead for upgrade to two-way cycling in the next phase of Camden's Cycle Grid programme. From there the old LCN route on Gloucester Avenue and King Henry's Road takes us towards Swiss Cottage (this notorious gyratory also programmed to be reformed for the construction of CS 11 up the Finchley Road next year), and thence back towards the ride's starting points in Brent. I think the ride will give a good overview of how a proper cycle network for London is now starting to emerge, after many years of hard campaigning for it by a great many people. For me, as I explained recently in a long, personal post, the story began in the late 1990s with the campaign in Camden for the original Royal College Street segregated cycle track (now replaced), a pioneering feature in London then, and then the campaign for the Seven Stations Link. These pieces of infrastructure I believe established and demonstrated in London for the first time the principles that we are now seeing rolled out on a much larger scale in the new Superhighways. Boris Johnson recently commented in the London Assembly that 'Virtually every cabinet member has ticked me off for the Cycle Superhighways', and I think this shows what a fundamentally unpopular course in the British political culture he has chosen to follow here, and how much credit he deserves for doing something really rather good, that will undoubtedly be the major legacy of his mayoralty. Also deserving of credit is his Cycling commissioner, Andrew Gilligan, for pushing recalcitrant officials and recalcitrant boroughs into action on the Mayor's cycling programme. When he was appointed in 2013, many wondered if, as a journalist, if he was appropriately-qualified for the job, but I commented at the time that his skills as a propagandist might just be those most needed in the role, and I think I was right. It's a fragile legacy. The next mayor has it in his or her power to get on with the programmes, fill in the worst gaps (for example north-south across the West End), connect up all the segregated Superhighways, extend them into all the outer boroughs, build more mini-Hollands like the successful Walthamstow one, break the major barriers in Outer London like the North Circular, and enhance the quality of the Quietways. Or he or she has it in their power to effectively abort the programme and leave the lovely pieces of engineering that we are now seeing in their glistening newness as sad stubs and monuments to what might have been, a transport revolution never delivered. As Cyclists in the City has recently commented, though the Green and Liberal Democrat candidates for Mayor in 2016 (who are not likely to win) seem highly committed to continuing the cycling programme, the commitment of the Conservative and Labour candidates, Zac Goldsmith and Sadiq Kahn respectively, is really not very clear from what either of them has said so far. 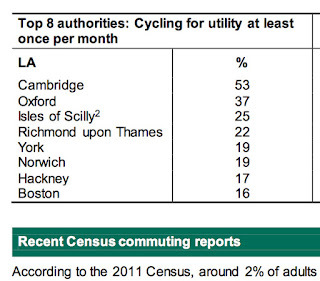 It's going to be another close race for Mayor in 2016, and the vote of cyclists is going to make a difference. I invite the two of them to commit clearly now to completing the current programmes and thereafter to further major expansion of high-quality cycling infrastructure, maintaining at least the current level of expenditure on cycling in London. In the shorter term, I invite you, if you can make it, to my tour of London's developing cycle network on Sunday. THIS is what real "taking the lane" looks like, not some temporary mirage dependent on a driver's temperament. Taken for good! He's referring to this picture of the very first cyclists to use the East-West Cycle Superhighway currently under construction on the Thames Embankment in London. I was originally going write a kind of review post called Reflections on reaching 500,000, marking the half million page views of this blog, but we have gone a bit beyond that now. I have not had time to comment on many of the recent developments on cycling in London, but I thought I would try to summarise the state of play now as I see it, how far we have come, how we got there, and where we are going: a big task, necessitating an unusually long post. The account will be, of necessity, quite personal. The quote from @AlternativeDfT contains, of course, an ironic reference to the technique of 'vehicular cycling' as taught in various manuals, but that won't actually concern me here. 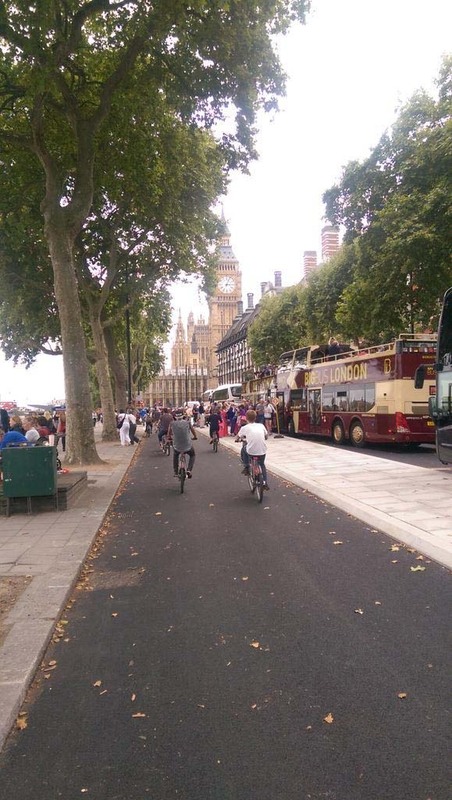 The picture of the East-West Superhighway in action at last, combined with @AlternativeDfT's concept of Taking the lane – for good rather summarises all I have been trying to achieve in over 20 years of cycle campaigning in London, hence the title. This blogpost is a kind of summary of the whole blog so far, over five years. 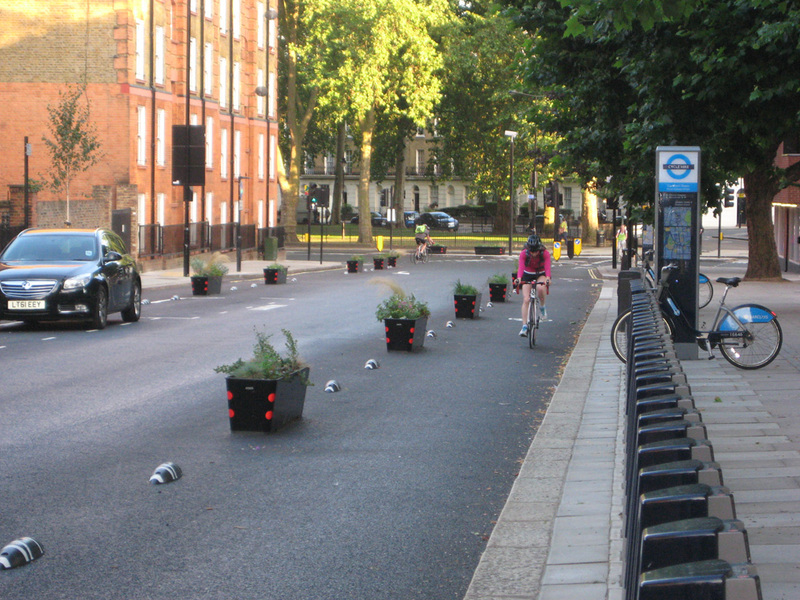 My main campaigning objective, as you will probably know if you have read earlier posts, has always been to get London to build a world-class network of segregated and largely-car free cycle infrastructure that will enable mass utility cycling. I became convinced that this was the correct direction in which to go in the late 1990s, mostly through discussions with Paul Gannon in the Camden Cycling Campaign, a branch of London Cycling Campaign. 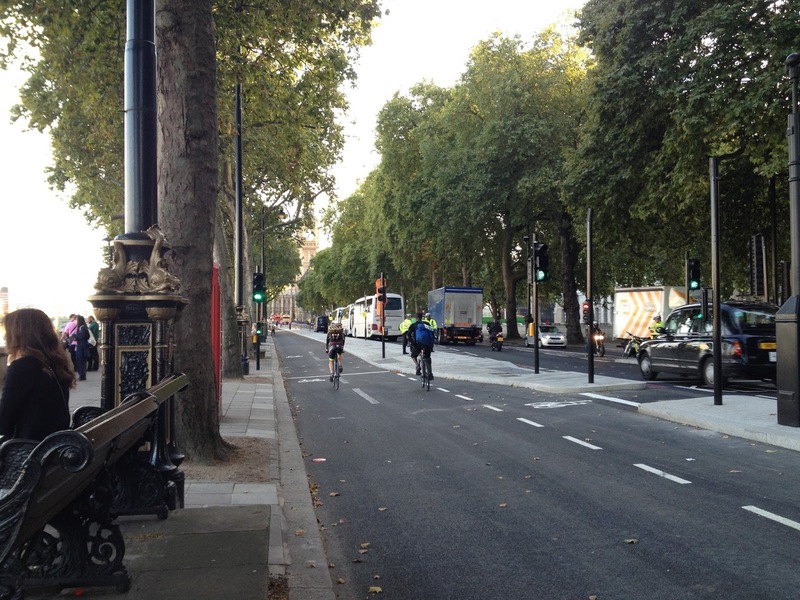 Our successes in CCC in that period were the construction of the Royal College Street segregated cycle track (the first one), and the east-west cycle track through Bloomsbury, as I have described before. These were early examples of taking the lane, in the sense of my (@AlternativeDfT's) title. We got Camden council to remove lanes dedicated to motor traffic on the road, and just give them to cyclists. This was a big step forward from previous London Cycle Network concepts of painting lanes on the road that drivers could still physically drive on and park in, or confusingly painting cycle symbols on largely unadjusted bits of pavement, which was, and tragically, still remains, one of the government's (the Department for Transport's) main recommendations to local authorities for cycle infrastructure. I authored a piece in the LCC magazine, London Cyclist, with Paul Gannon, published in the October 2002 edition (you can read it here), in which we went through the whole argument about the need for high-quality segregated cycle routes to change the reality and perception of safety of cycling in London and readjust the demographic balance of cyclists to make it more like that found in the Netherlands and Scandinavian countries in order to make high levels of utility cycling (which I would define as a modal share of all trips above 10%) a practical possibility. We used graphs, figures and international comparisons, and we showed pictures of good and bad segregated cycling schemes in London, pointing out the errors that cause failure of some schemes. We also discussed the need for more and better training of cyclists, that would need to take into account the skills required for using a proper cycle network in a city of mass cycling (not just teach cyclists how to defend themselves against drivers on the roads), and the need for changes to the UK legal framework to balance it more in favour of the rights of vulnerable road users. But we were rather clear that the most productive thing campaigners could do at that moment was to campaign for more high-quality segregated cycle tracks on the roads. The key to the problem was taking the lane. This was all pretty revolutionary stuff at the time; though not novel – other authors, notably academics like John Parkin, had written similar things before, but it was unusual find these ideas advocated in grass-roots cycle campaigning at that time, I don't think any other article had every been published on similar lines in London Cyclist (which had been published since the 1980s), and such view were very widely attacked by other campaigners. Nevertheless, it was all an extension of other developments that had already been occurring: some moves, from as early as the1980s, to establish a London Cycle Network that would, as David Hembrow would now say, unravel cycle journeys from busy motor routes in London. We can see some of these early attempts in a classic film now on YouTube: GLC Cycling for London from 1984 shows examples of cycle crossings of main roads, no-entries with exceptions for bikes and other early attempts to allow cyclists to thread a path through relatively traffic-free minor roads that was not possible for motor vehicles. Interestingly, many of these facilities still exist today, virtually unaltered, including the so-calle Ambassadors Route, which is shown. 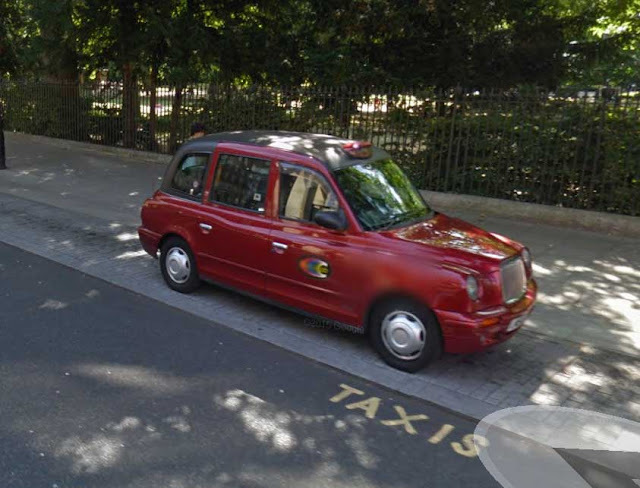 It has long ceased to be known by that name, but still runs from Albert Gate in Hyde Park to Chelsea Bridge. These early network attempts were pretty limited because they tended to run out of ideas in the many places in London where main routes could not be avoided, particularly on and approaching crossings of the Thames and other barriers, they did not deal with major junctions very much nor physically reallocate any space on crucial main roads, they were built to low capacity standards, and they were sparse, soon exhausting the practical possibilities for running useful cycle routes entirely on the network of back-streets. Nevertheless, by the early 2000s, despite the slowdown in building them caused by the abolition of the Greater London Council (which produced the film), but because of the persistence of local campaigners, like us in CCC, trying to improve standards and ambition from the various borough councils that took over responsibility for the cycle network from the GLC, they had certainly made an impact. Cycling in London was on the rise, reversing the downward trend of the post-war period up to the 1980s, and in the same issue of London Cyclist that I already mentioned, October 2002, in which Paul's and my article appeared, we find this letter to the editor, which I urge you to read in full. Well, perhaps it's a bit overstated, but I find this quite moving, coming as it does in the same issue in which Paul and I laid out the rationale of the segregated tracks we had been developing, and which Mike Aitken had already discovered and been so pleased by, and to me it's an important piece of evidence as well. It coincides with my view that the beginnings of a cycle network that had been developed in London by 2002 were actually effective in promoting journeys by bike, particularly in central London – even poor cycle facilities do have some positive effect – and it opposes the view that I have often heard stated, particularly by Roger Geffen, policy officer for CTC, that the moderm upsurge in cycling in London was independent of any provision, and particularly occurred without the provision of segregated space. I hold it did not. Segregated space and almost car-free space as part of the network was developed from the 1980s onwards, mostly by allowing cycling in the parks, on bits of embankment and towpaths, by providing cycle-specific connections which allowed these spaces to be utilised and accessed from the road network, and by means of minor road routes facilitated by the types of means shown in the GLA video and referred to in the letter. This, remember, was the period before the congestion charge, and a period when Inner London was still depopulating, and an increase in cycling could not be attributed to increasing population density. Counts of cycles on screen lines provide the most accurate figures for cycling, and the data shows that cycling into central London was on a clear upward trend from the mid 1990s, and into inner London, increasing from 2002. The early, poor London Cycle Network did actually, to an extent, work, and our work in adding into it the first substantial, properly segregated on-road routes in Camden (which got extended a bit into Islington as well, but sadly not Westminster) enhanced it considerably, though only very locally, so you would be lucky to find yourself, like Mike Aitken, in the position where the new routes helped your commute. I went into, in my earlier article, why the Bloomsbury route never achieved its potential, as it was compromised and mis-constructed into a space half the desired size. Basically, in this period, few politicians, and perhaps even fewer cycle campaigners, believed there was actually any demand for cycle routes like this. There was a belief that they would not be used much, and certainly they would not fill up. Paul and I were not surprised, but virtually everyone else was, that the Bloomsbury route was full to capacity from the day it opened, and remains so today. We fondly hoped that such immediate success, and particularly with a route in quite an 'iconic' location, known to many Londoners, by the University of London and Dillons (now Waterstones) University Bookshop, the concept would rapidly spread, and other boroughs would build similar routes. But things are never quite as simple or as easy as this. Lack of borough resources no doubt played a part, in the era before the GLA and TfL were established, and lack of coordination between the boroughs and relevant leadership within them, but certainly a factor was the continued division amongst cyclists, within the LCC and CTC, and local groups, as to the in principle desirability of segregating cyclists from motor traffic. To say this today will sound strange to many, but the poor quality of information available at that time, in this largely pre-internet age, and climate of misinformation, spread by the likes of the American author John Forester, and his UK equivalent John Franklin, about the nature and results of segregated cycling systems across the world, which was widely manifested in what Paul Gannon has described as a counter-evidential 'campaigners' groupthink' within cycling organisations, where you wouldn't really be accepted socially unless you toed a certain philosophical line – the integrationist, pro vehicular cycling line according to the gospel of Frankin and Forester – resulted in it being very difficult for those cyclists (probably always a quiet majority), who felt instinctively that what the wide public really needed and wanted was to be able to cycle in a motor-free environment, to express that view wihout being shouted down, demeaned, or told they were ignorant of all the 'facts' and 'research'. So history moved on. Tony Blair gave London a government again in 2000, and Ken Livingstone, previously leader of the Greater London Council, which had begun the London cycle Network in the 1980s, became Mayor. But Livingstone, a non-cyclist and bus enthusiast, never understood cycling, and his re-warmed cycling programme, called LCN+, soon ran into the sand, not being not based on the type of understanding we had been trying to promote in Camden for the need for demographically inclusive cycle facilities, nor backed by the political will to tackle the difficult places, the big, unavoidable roads and junctions, ther Niagaras and vortexes, in Mike Aitken's terms, that remained huge barriers everywhere, in places like Elephant and Castle, Swiss Cottage, Kings Cross, Bank and Bow. The concept in LCN+ was still one of basically trying to connect up backstreets, but, as I said, the easy possibilities for this had really been exhausted already in the first LCN building phase. 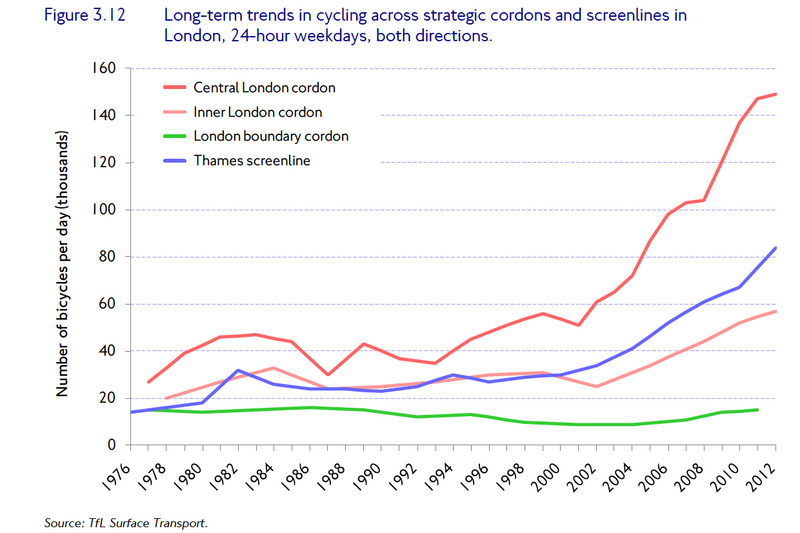 Far more significant were other things that happened in this period: the introduction of the Central London congestion charge in 2003 caused a massive transfer of private car journeys directly to the bike, as the graph above shows. Ken's enthusiastic extension of the bus lanes (shared with cyclists) no doubt helped a bit for cycle commuters travelling at peak hours when the lanes were in operation and free from parked cars (though junctions remained dangerous). The 7 July 2005 bombings of the tube and bus network also seemed to cause some people to start cycling as a permanent lifestyle change, and the changing demographics of London, with an inflight to the inner city, reversing decades of exodus, probably enhanced the trend. It was clear by the end of Ken's period in office, 2008, that a change of direction was needed if any cycle growth momentum was to be sustained, and the new Mayor, Boris Johnson, who was a cyclist, proposed the Cycle Superhighway project to replace an abandoned LCN+: a 'network' or twelve radial routes into central London from the suburbs, mostly on major roads controlled by the Mayor's transport organisation, TfL, not by the boroughs. I put the word 'network' in quotes, as it was not a network, the routes failing to link up in the centre. 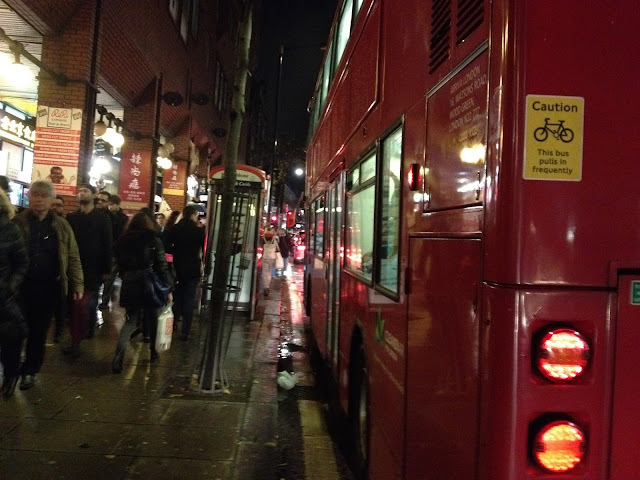 Moreover, the whole conception of the routes was, as I commented at the time, 'calamitously inadequate to the task', with little segregation, routes largely using busy bus lanes, and parked on much of the time, and lethal junctions. (Literally lethal junctions, as people soon started to get killed on Superhighway 2). Unfortunately the LCC went through a period, at this time, of ineffectual campaigning and weak leadership, with a chief executive, Koy Thomson, who believed in not criticising the authorities too much for fear of being excluded from influence and negotiations, and having no desire to take the membership on to the streets and protest, or otherwise be seen to be 'too militant'. There was also the issue in the background that LCC, and even more so CTC, had never grappled with the segregation issue. They did not really know what they wanted as organisations, in terms of policy for accommodating cyclists in the transport network, at a very fundamental level, so couldn't argue for any coherent alternative to mis-concepts like the first generation cycle superhighways. There was a fear of confronting the division that existed, which resulted in a kind of paralysis. Also, there was the concept of not 'dangerising' cycling, which was highly prevalent, and generally corresponded with an anti-segregation stance. We couldn't campaign for safe facilities because we couldn't talk about the danger that existed, for fear of putting off new cyclists, which was believed to be counterproductive, since it was felt that there was 'safety in numbers' rather than in properly-designed infrastructure. These beliefs came very directly out of the Franklin-Forester 'religion'. I've taken on this belief-system in this blog several times, and a nice recent article by As EasyAs Riding A Bike does a good job (again) of demolishing this nonsense. But at one stage in Koy Thomson's LCC, campaigners were actually told not 'to use the D word' in their public pronouncements! But times they were a-changin'. 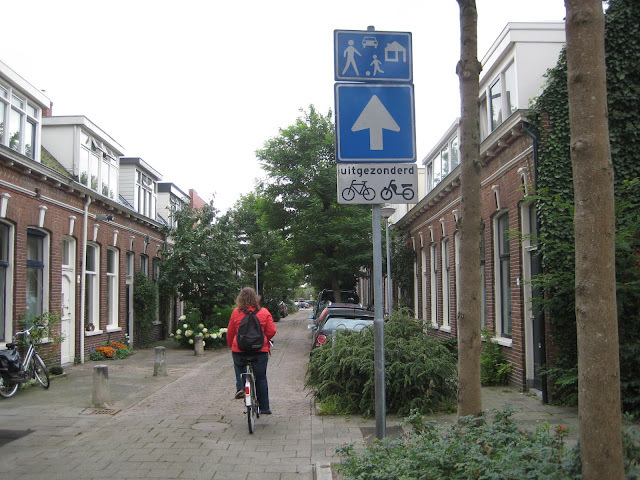 The dark ages of the lack of information about how segregated cycling actually worked in the Netherlands, Denmark and so on were being swept away by blogs like and A View From the Cycle Path, Copenhagenize and others you can see in the sidebar of this blog. Home-grown London blogs like Crap Cycling and Walking in Waltham Forest, Cyclists in the City and iBikeLondon proved a significant force to mobilise a new movement, and the Cycling Embassy of Great Britain was formed to spread information about good and effective cycle engineering practice in the UK, and campaign for its implementation nationally. A new, dynamic CEO of LCC, Ashok Sinha, decided that the organisation needed to organise big, clearly directed campaigns, involving mass protests on the streets, as well as lobbying all the levers of power. The Tour de Danger, breaking the taboo on 'the D word', around all the worst junctions in London, was one of the first of these mass protest rides, organised initially by bloggers, and then endorsed by LCC, who did organise the string of protests at Blackfriars, covered in early posts on this blog. Also, significantly 2011, Sinha decided to consult the LCC members, the ordinary cyclists of London, directly, on what they actually wanted the organisation to campaign for in the run-up to the mayoral election of 2012. I proposed that they should be asked whether they wanted to campaign for segregated cycle routes like the Camden ones, for more taking the lane. As I expected, they massively concurred. This campaign was styled under the slogan Love London, Go Dutch, and a set of demands was put together and promoted in 2012 in a manner that made it very clear to the candidates for mayor that London's cyclists were a substantial, committed and united lobby who were demanding space to be taken from motor vehicles on main roads and physically reallocated to cycling, primarily for the benefit of the vast number of people who could cycle, but refused to do so under existing conditions. So successful was the campaign that all the mainstream candidates signed up to the demands, though I was sceptical about the true commitment of Boris Johnson to the programme. After his re-election (very marginal, in which the votes of cyclists could have made difference), things moved slowly, and there was talk of a new programme and a new person to take on a job as the Mayor's Cycling Commissioner, but little apparent action through the remainder of 2012. In October of that year I met the journalist Andrew Gilligan at a conference on Love London, Go Dutch organised by LCC and the Dutch Embassy with participation from TfL and the DfT. He asked my opinions and I emphasised to him the need for high-profile, effective segregated cycle tracks on London's main roads. I think he was already convinced of the case for this. When asked what was the one scheme that could make the biggest difference, I said the most obvious and easiest 'big win' was a segregated route along the north side of the Thames, on the Embankment. I may not have been the first to suggest this to him, but I can thus possibly claim some parentage to the East-West Superhighway. Three months later, in January 2013 it transpired that Gilligan was the Mayor's Cycling Commissioner. In March he produced The Mayor's Vision for Cycling in London document that made promises pleasingly close to the Love, London, Go Dutch campaign demands. 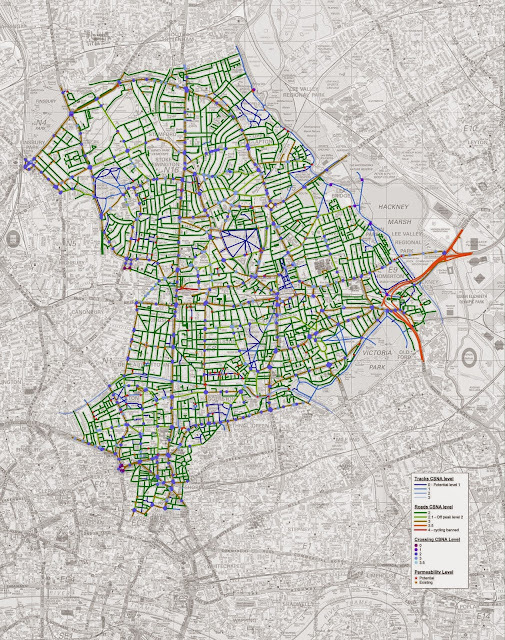 Critically, the Cycle Superhighways were to be upgraded and re-planned to the standards demanded, with large-scale segregation, and a grid of routes in central London was to be created to connect them up. The healine scheme was to be the route on the Embankment that I had suggested, styled Crossrail for the Bike extended east and west from Barking to 'the western suburbs'. 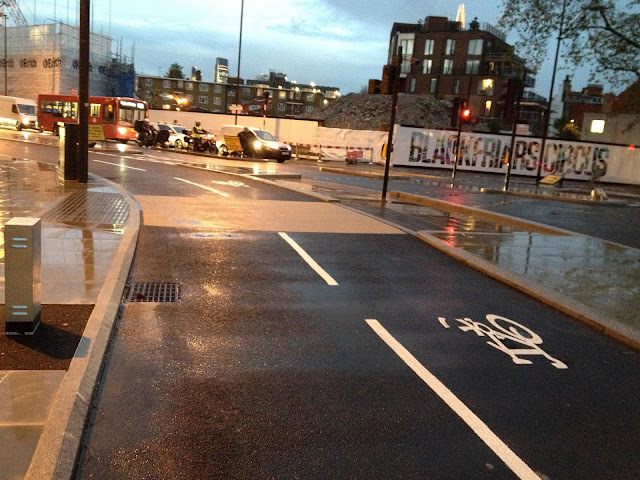 So clearly the Camden-pioneered programme of Taking the lane had been re-started after a decade and a half of delay. At its October 2013 AGM, LCC further solidified its policy on physical provision for bikes, mostly through the efforts of its dynamic new Board member and Chair of its Policy Forum, sociologist of transport Rachel Aldred. The elected Policy Forum had been established at the initiative of Ashok Sinha a year earlier, to sort out the thorny issues I have dwelt upon above, but it had been initially chaired by Hackney anti-segregationist Oliver Schick, so had made no progress. Influenced by the Dutch standards being promoted by the Cycling Embassy of Great Britain, the Policy Forum now proposed to the Campaign that the bar for segregation to be demanded on cycle routes was to be set at 2,000 vehicles per day and 20mph. The AGM accepted this policy proposal, along with another from me on Uniformity of Provision, designed to put an end to two-tier network thinking and official discrimination that traditionally operated through providing for different notional 'types' of cyclists differently, so setting-up unacceptable choices between safety and convenience. The new standards LCC adopted in 2013 meant that without speeds of 20 or lower plus very low motor vehicle volumes (generally only attainable on roads closed to through motor traffic), the campaign would henceforth not except as adequate route implementations those which were not physically segregated by some means or another. This was, at last, the clear and definitive endorsement of the policy I had been seeking since before 2000. The long internal arguments were over (in LCC, if not in the national organisations CTC and Cyclenation), and we could campaign unequivocally for what we needed for inclusive mass cycling. One novel means of segregation was being experimented with in Camden, where the Royal College Street track was rebuilt in 2013 with lightweight segregation on both sides of the road, to allow a capacity increase of at least 33%. This was another significant bit of taking the lane. Hard to recall now, but before 2000, Royal College Street was a three-lane one-way motor racetrack. 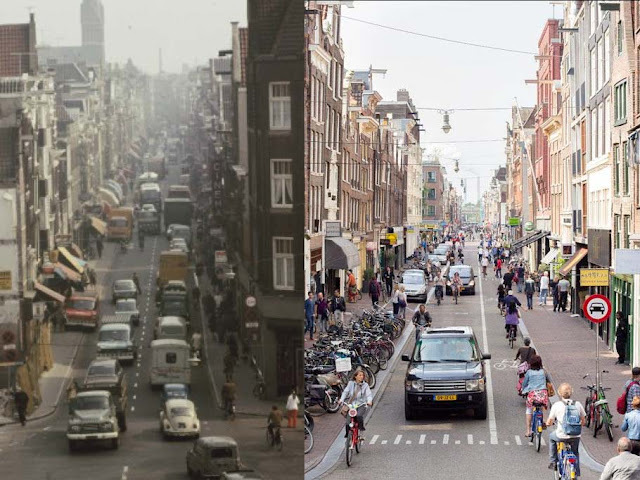 In 2000 we took one lane from the cars, and in 2013 we took another. It is now one lane for cars, still one-way, but transformed out of all recognition from 15 years ago: a testament to, and a proof of the effectiveness of, visionary, but gradualist, campaigning. LCC launched a further big campaign for the 2014 local elections in London entitled Space for Cycling. This was based on the polices adopted in 2013, and the idea spread to other parts of the country, with CTC and Cyclenation endorsing a national campaign along the same lines. 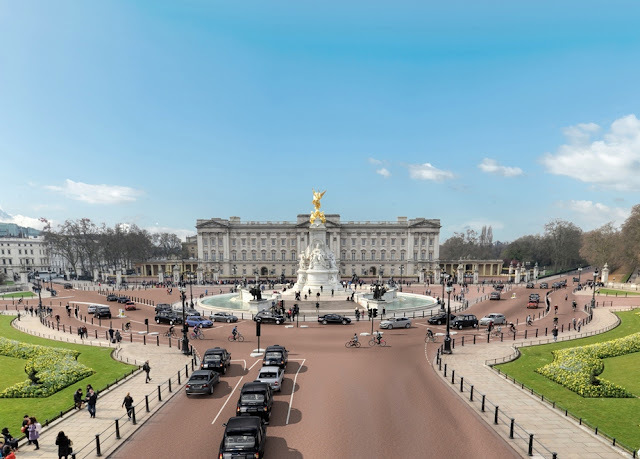 So now the cycle lobby nationally was asking protected space on main roads and through major junctions, another landmark whose significance will be appreciated only a few people who have been involved with this over a long period. To those who became involved only more recently, it will just seem reasonable and expected. Back in London, it was satisfying to the the designs produced in September 2014 for the East-West Superhighway (as Crossrail for the Bike was subsequently renamed) and North-South Superhighway as being pretty much as ambitions as I would have liked them to be. We were to get, at long last, after all the protests, segregated cycling on Blackfriars bridge, a huge amount of motor traffic space was to be removed in the Blackfriars area to be given to the intersection of the two flagship segregated routes ('shockingly different' was how Cyclists in the City described the visualisation of this), and a high-capacity segregated route was to be driven right through that horrible gyratory Parliament Square and past the Houses of Parliament themselves. If we had believed in Camden in 2000 that our Bloomsbury route was a high-profile one, that would achieve a step-change in thinking as to what was possible for cycling on the streets of London, then this would be ten times more so. I've already reviewed the problems and hold-ups and inevitable dissapointments that have accompanied the first two years from the publication of the Vision, and I don't need to go through that again at the moment. A huge battle for public opinion in the consultation on the E-W and N-S Superhighways was fought and won. 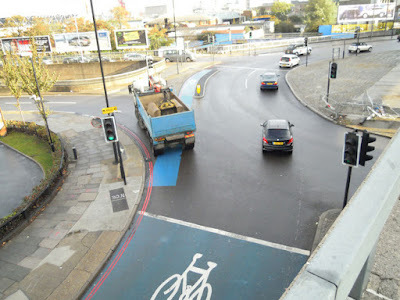 Even in the week of writing this, on 18 August 2015, it has been announced that the London Taxi Drivers Association is trying to stop completion of these routes through the courts, though construction is well underway, and part of the E-W route is already being used by cyclists, as we saw in the picture at the top of this essay. This challenge will, I predict, fail, but it emphasises the battle that we still face in taking the lane, and probably always will. What do we have happening in London now? I can't cover it all, but we have construction of the East-West and North-South Superhighways, with the parts already consulted on due to be completed in Spring 2016. We haven't had plans for the full originally-promised Crossrail route from the 'western suburbs' (wherever they might be) to Barking, and I sense backsliding on this, on which we need to be very vigilant as the 2016 Mayoral elections approach. 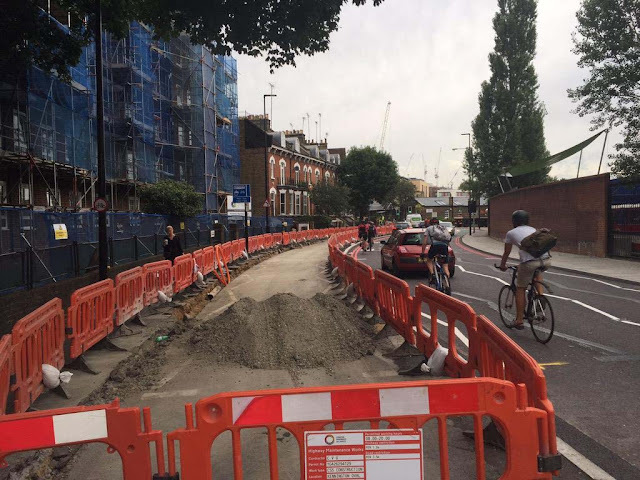 We have construction also ongoing of a pretty good looking Cycle Superhighway 5 between Oval and Belgravia, via a segregated two-way track on Vauxhall Bridge, which is already open. This should make an end of the Vauxhall Gyratory nightmare once and for all, and another landmark here is the first genuinely purpose-built, high quality piece of space reallocation on a Thames bridge. Though CS5 is intended to go to New Cross, however, we have not yet seem detailed plans for the rest of it: furthermore, the City of Westminster have not clarified how it will run north of Vauxhall Bridge, so these are more issues on which to be vigilant. Some upgraded segregated sections of Superhighway 2 to Bow have just opened. I haven't experienced the route myself, but here is as early account. This route still clearly has major gaps and dangers that TfL has not presented satisfactory proposals on. But progress is being made on this notorious route; the cycle space is gradually being physically taken from motor vehicles. 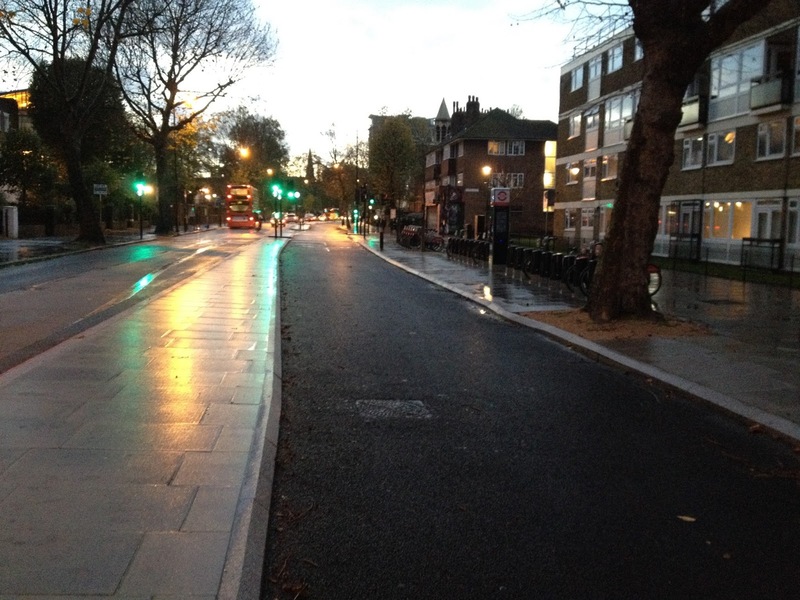 Separately from the Superhighways programme, as part of the Central London Grid (first proposed by LCC), Camden has been extending the segregated route on Royal College Street down Pancras Road, using stepped cycle tracks similar to those employed on Old Shoreham Road in Brighton. This work is also ongoing. Camden has plans also to create segregated tracks in both directions on Delancey Street, which will link the northern end of Royal College Street westwards towards Primrose Hill and Regents Park – a much needed part of the network jigsaw that I first proposed a long time ago, but TfL buses seem perversely to be creating problems with this plan. Camden, still the leading borough for cycle tracks, has plans for more stepped tracks on Gower Street (also in fact an indirect result of a suggestion I made, though the solution they are working on for Gower Street and Tottenham Court Road is not as good as the one I advocated, which would not have involved undoing the one-way system for cars). 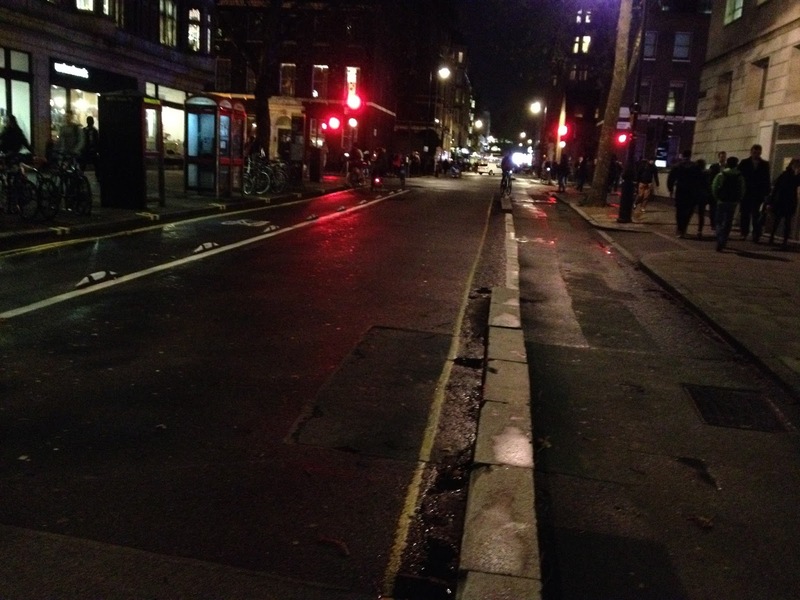 Work on designing signalisation to separate the cycle flows from motor flows on the five signalised junctions on Gower Street (similar to what has been done on CS2, above) is, I hear, ongoing. Further down the pipeline is work to create a proper cycle route on that busiest of central London cycle corridors – Bloomsbury Way, Theobalds Road and Clerkenwell Road – a concept that has been dubbed the Clerkenwell Boulevard. 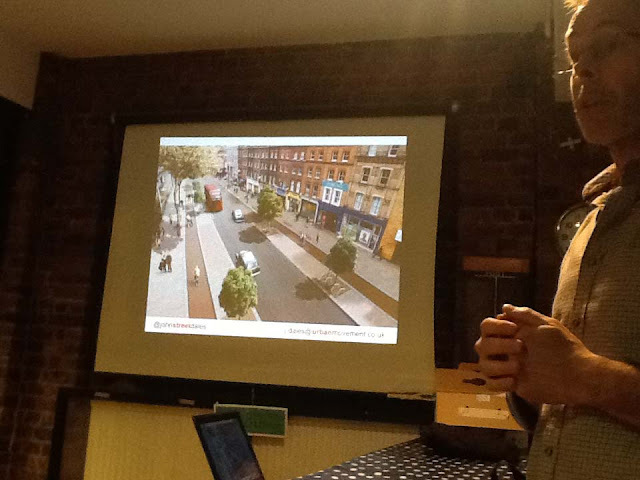 The boulevard concept is as yet only an idea from campaigners, originating with Andrea Casalotti, but it is being seriously investigated by Camden Council. It is a critically-needed part of the Central London Cycle Grid, linking the ends of the various Superhighways and other routes and creating a second east-west axis after the Embankment Superhighway. The boulevard would need to be implemented by Camden and Islington councils with TfL co-operation. And there is more in Camden. Finally the Bloomsbury route (or Seven Stations Link, the name we gave the route when we invented it in Camden Cycling Campaign in 2000) is to be upgraded to the capacity it so desperately needs. The plans are for the current two-way track on the north side of the road to become the eastbound track, with a new westbound track on the south side, and a whole motor lane removed from most of the route with one-way arrangements for motor vehicles that will minimise through-traffic and conflicts at the junctions, as described in detail here. So, another object lesson in how progress can be achieved: as at Royal College Street, a two-way track on one side of the road can, when the demand has been undeniably demonstrated, be easily upgraded by adding another track on the other side and making the original one-way, removing another motor traffic lane or a parking lane. Just as we predicted that the Bloomsbury route would be at capacity as soon as it was built, which it was, so I predict that the East-West and North-South Superhighways will be at at capacity as soon as they are built. And I think we can see how that will need to be resolved by the next Mayor. Campaign video to show the need for upgrade of the Tavistock Place Cycle Tracks from Camden Cyclists on Vimeo. Out in the north-west suburbs, where I live, we have seen no promising developments as yet. We await the advent of Cycle Superhighway 11, to run largely on the A41 from the West End to Brent Cross. We have not seen any plans for this so far, but it has to be of comparable standard to the Superhighways being built elsewhere in London. It must be at the very least a fully segregated two-way track on one side of the road (I favour the east side) achieved by removing one whole lane of motor traffic on the southbound side of the road. Nothing short of this will do, and I'll be watching this very closely. 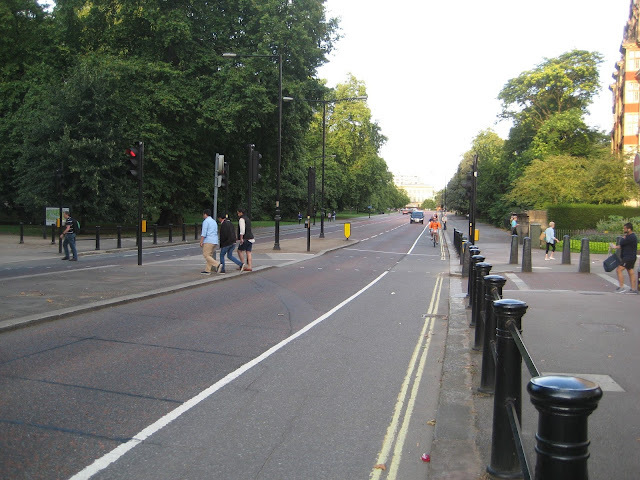 All we have seen so far has been some consultation by the City of Westminster on their proposal for painted cycle lanes on Avenue Road, between Swiss Cottage and Regent's Park. This will not do, and I strongly hope it will not do for Andrew Gilligan as well. I've made all the foregoing sound like a great success story, from my point of view, but I remain cautious. We are still a world from the comprehensive 'go anywhere' all-abilities cycle network we need in London to turn it into a world-class cycling city. I've already had the disappointment of expecting the manifest good of the cycle tracks implemented in Camden in the early 2000s to be rapidly understood and replicated all over London, only to find the project stalls for a decade and a half due to many other factors. I have ceased to believe there is any automatic route to progress, and that everyone else in the capital will suddenly see the light and start demanding this infrastructure in their neighbourhoods in a way that politicians find impossible to resist. The forces opposed to us remain very strong, and we are only a very small distance towards our goal. Progress after the current flurry of building, corresponding to the end of Boris Johnson's mayoralty, could yet stall with his successor, and we could be left in limbo for another decade. I now believe that every meter of new segregated space for cycling will continue to have to be fought over tooth-and-nail for the forseeable future. I do believe that the current generation of segregated cycle routes, once completed, being much higher profile than those which we achieved in Camden 15 years ago, will make it obvious to far more people in London and the UK more generally that this is a means of achieving more pleasant and more efficient streets for everyone – cyclists, public transport users, pedestrians, business owners and motorists – whose results are superior to those produced by any other means: by that I mean, superior to the results achieved by mere implementation of lower speed limits, or superficial redesigns, such as Shared Space schemes. Another point is that, whenever we get a success in implementing a segregated cycling scheme, in my experience some foolish person always pops up to say "You did not ask for the right thing, you should have got elimination of all motor traffic on this road instead". Now it should be noted that usually this person never successfully campaigned for his preferred solution anywhere, nor discovered the real political and practical difficulties inherent in his idea, but has an unrealistic concept of the political process of negotiation over the use of street space, and no concept of a network of where the motor vehicles need to go. 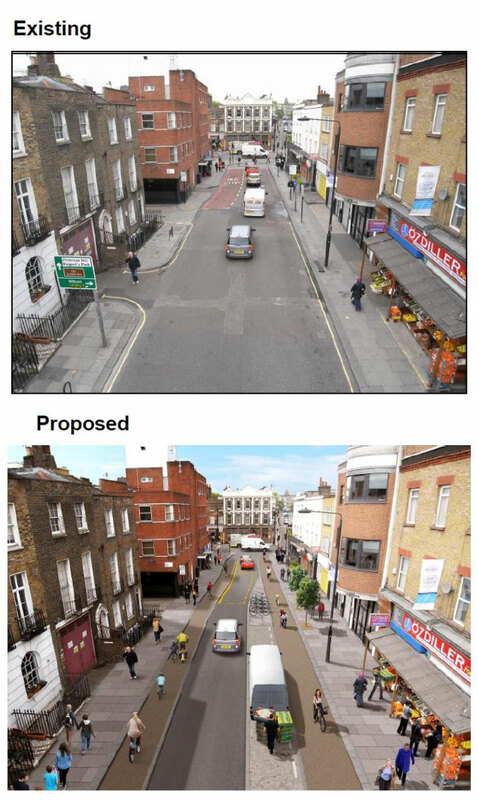 I have always believed in putting forward ambitious, game-chaging concepts that will inspire people to see how our streets can be used in new, better and more efficient ways, and this was why I supported or proposed Royal College Street, the Bloomsbury Route, the Embankment route and so on. I have continually, in this blog, told campaigners not to 'fight over scraps' or make demands which are too small to make a difference or inspire anyone; this has been a guiding principle of mine. But I am also a realist, and no fundamentalist ecological anti-motor campaigner. I don't think cars, vans, lorries and buses will ever be eliminated from London, not in the lifetime of anyone now living, at least, I don't think they will be eliminated even from central London, and I don't really think they should be, either. They have many uses. They have become essential to our system of living. We can get a better balance incorporating them, but we cannot eliminate them. There will continue to need to be a practical working network of roads for motor vehicles, allowing access to all properties, throughout London, for all the future that I can foresee. 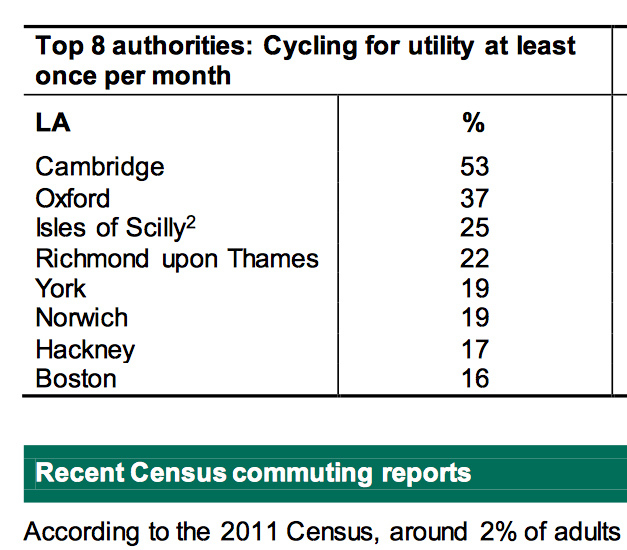 Our cycle network proposals need to take this into account and allow it to be. All the schemes and proposals that I have mentioned and supported allow this. Going back to those early days in Camden Cycling Campaign in the 1990s, one of the main arguments that Paul Gannon was advancing at that time, which didn't seem to have occurrent to anyone in UK cycle campaigning before, was that segregated cycle tracks, with continuing motorised use of the rest of the road, are really the only way to square the need for workable dedicated cycle space with the need for taxis, buses and delivery vehicles to continue to be able to operate on necessary through-routes. The argument for cycle tracks, as opposed to fully closing roads to motor vehicles, has aways been an utterly pragmatic one. However ambitious the plans have seemed, the intentions have been limited and pragmatic. I've never set out to solve all the problems inherent in the use of motor vehicles with proposals for cycle infrastructure, and I've not set out to redesign the entire urban transport jigsaw. I've not set out to change the world, only to achieve the limited objective of getting more people enjoying the experience of riding bikes. I've set out to import the best bits of the cycling systems of places that seem to do it well, like the Netherlands and Denmark, but I've not claimed that they offer all the solutions to transport or environmental problems. So, where now for the campaign? We've established clear principles for what we would like to see. We've largely ended the internal arguments within the cycling world that blighted the earlier years of my history here. 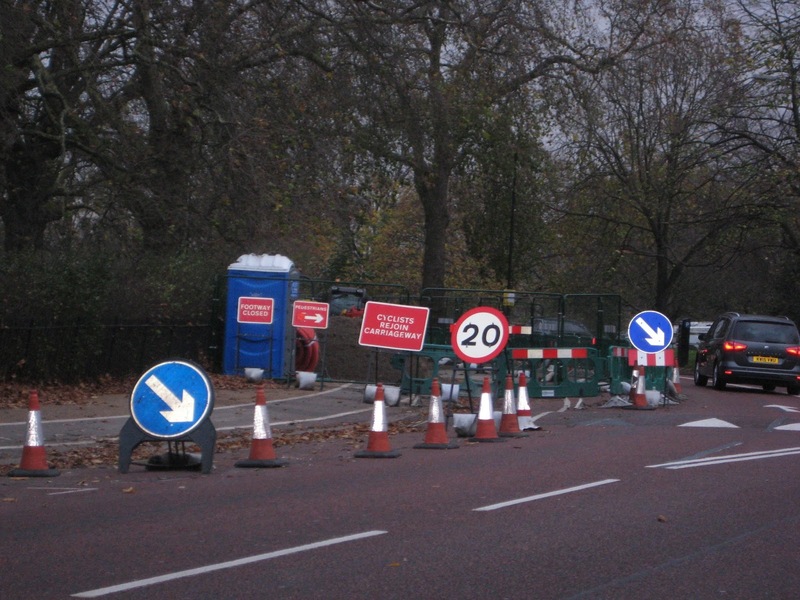 We have a programme ongoing from the Mayor for the upgrade of the Cycle Superhighways, and from some boroughs for the construction of some other routes, to fairly good standards. We have new junction designs being tried out that aim to eliminate turning conflicts between bikes and motor vehicles by separating flows in time that cannot be separated in space. We have some sensible design standards for the new cycle facilities in London, and some good people in place in TfL. We are starting to learn from the Dutch experience, from the nation so far ahead of the rest of the world on these concepts, but we have many elements that are obstinate to learning, There are many in the GLA and Transport for London, and many in more in the boroughs, who are in positions of power and do not believe in the cycling agenda at all. To get building started on the East-West and North-South Superhighways was a huge battle for the progressive elements in the GLA and TfL. We will need to convince the next Mayor, elected in May 2016, to continue, improve and extend the programme, to spend more on cycling, and spend it efficiently and productively. We need an extensive and intensive network, and we need the quality, simulataneously, to achieve our objective of 'mass cycling'. We need to make the next Mayor understand that, want that, and be committed to that. But we also have huge problems in the division of responsibility in London government. We have a Mayor with very limited powers over roads (though he controls the funding of changes on them) and we have 32 boroughs of diverse political and philosophical complexions that control most of the network. 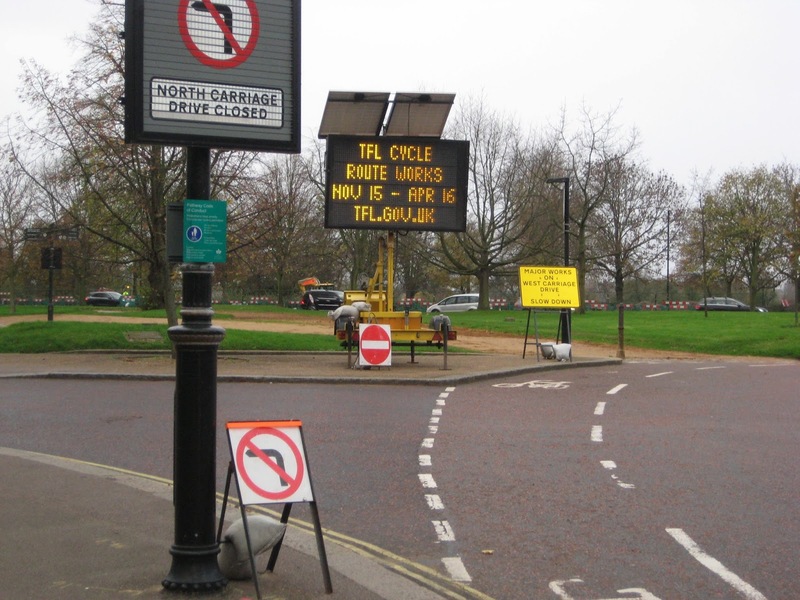 We have odd bodies like the Royal Parks, the Crown Estate Paving Commission, the Canal and River Trust, and the Corporation of London, that control bits of territory – roads, paths and open spaces – all over the place, having the arbitrary and democratically unaccountable power to scupper the Mayor's cycling schemes. The Mayor very nerarly had to use his ultimate power, through the Secrtetary of State for Communities, to remove control from one of the boroughs over a section of road on the East-West Superhighway, in order to get that route agreed, and the Royal Parks continue to stand in the way of a sensible solution to the Superhighway in the Buckingham Palace area, and also threaten CS11, which will need to use a (closed) Outer Circle of Regent's Park. TfL needs more powers over roads in order to implement a complete cycle network, without a doubt, but this is not within the Mayor's power to grant. 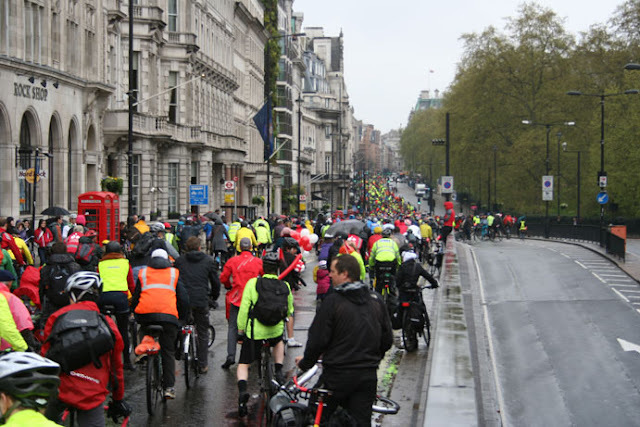 It will require lobbying of the government to achive this, and at the moment it looks unlikely, with the continuing lack of leadership and stick-in-the-mud attitude to cycling from both the Department for Transport and the Department for Communities and local Government. Maybe we can somehow get the London MPs cross-party to propose extra powers for the Mayor and TfL, but this looks a long shot. Having established the principles, I believe the campaign needs next to become one on the scale of the vision. Even without new powers for TfL, that body has in its power, if the next Mayor so wishes, to implement the type of solutions we are seeing on the latest Superhighways, or on Pancras Road, Gower Street etc, on every road it controls in London. We need to demand an end to main roads in London that do not provide practical separated space for cycling usable by all; Space for Cycling should not be restricted to a few arteries, it needs to become the standard, through a massive programme of progressive upgrading of the whole TfL-controlled network, that will, of course, need to deal with the remainder of the dangerous junctions as well. At they same time, the next mayor will need to cajole the boroughs into implementing similar solutions on all of their main roads and junctions, providing the necessary funding for them to do so. It's a tall order, but I have said we need to be ambitious, and this is what I think we need to be asking for in 2016: a programme of installation of cycle tracks on all TfL-controlled roads, plus strategic borough roads as well. In this context, the feeble and inefficient Quietways programme, re-cooking the old LCN concept, can probably be allowed to wither and die by the next Mayor. 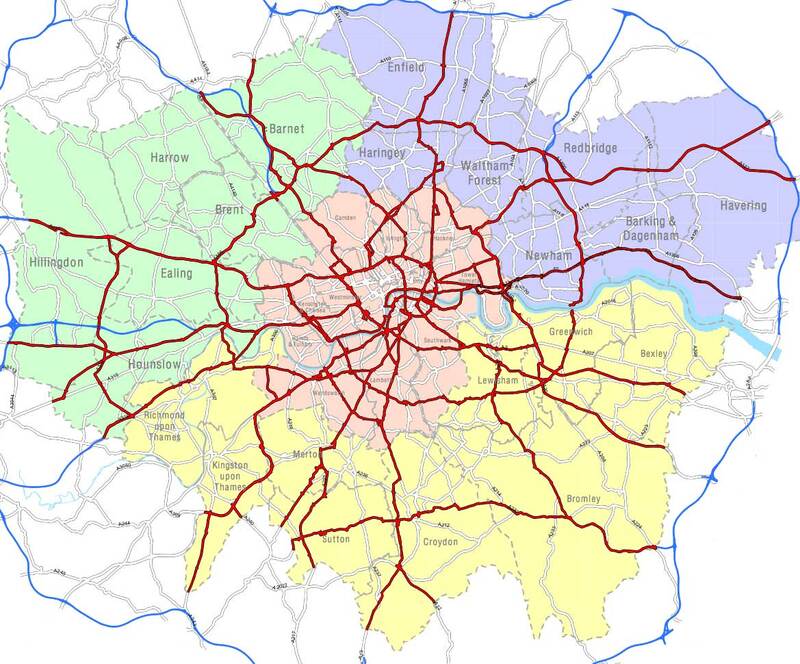 The TfL route network, in red, shows the very minimum coverage that we need to start to achieve a segregated cycle network on London's main roads; eventually we will need segregation on all the white roads (borough A roads) as well. Of course we need more than this; we need local rat-runs cutting, we need lots of traffic taken out of town centres and out of residential areas, we need better routes through parks, and the rest of it, but the demand for the tracks on all the main roads is a simple, comprehensible and saleable one, achievable, I believe in the medium term (say less than 10 years), and it would bring far more benefits and raise cycling levels faster than any other possible change. And it is not a fantasy, it's what they have in Copenhagen, I've seen it, and it works. Of course, if we demand it, we won't actually get cycle tracks on all the main roads, but getting the next Mayor to be working towards that objective would get us an awfully long way. I've laid a lot of stress here on what actually happened in the campaigns over cycling in London over the last two decades, as I saw, and I've often been accused of over-esimating the impacts of campaigns, by some in the cycling world who seem to want to regard us as powerless pawns in the face of some vast, faceless bureaucratic government machine that does what it wants, serves its own interests and does not listen to special-interest voluntary group very much – well, not in this field anyway. In this narrative, something called 'culture' or 'tradition' determines what sort of society and infrastructure we get, this traps us in certain patterns of behaviour, and there isn't a heck of a lot we can do about it. Well, this is a matter of personal temperament and attitude, clearly, and there is certainly something in the 'bureaucratic barriers' narrative. I have often railed against these myself. But I give this account as I experienced things, and my experience was very clear. Before 1998 and the start of the Camden experiments, no cycling campaign group in London asked clearly for Dutch-style segregated cycle tracks on roads. Camden Cycling Campaign decided to do so, as a policy, going far out of line with what the rest of the UK cycling world was up to at that time. We asked for them, and, strangely enough, after a determined campaign, we got them. Of course they weren't done exactly right and we got less than we demanded, but we got enough to work and demonstrate a principle, and now those pieces of infrastructure form a basis that is being extended in all directions, as well as having the original parts upgraded. By exact parallel, it was only when London Cycling Campaign took on the historic divisions over the segregation issue, put the issue to votes, and formulated clear policy on the matter (which some strongly disagreed with, and continue to do), and launched an energetic campaign, mobilising the membership and a wider part of the public in favour of this new vision, that, lo and behold, an initially very sceptical mayor bowed to the pressure and started to build what we wanted. I should not neglect to mention the influence of other, allied but separate campaigning groups in all this, particularly the 'pop-up campaign' Londoners on Bikes, which worked to take the Go Dutch message to politicians in the 2012 London elections, CyclingWorks, which did a tremendous job mobilising big employers in central London to come out in support of the 2014 Superhighway plans, and Stop Killing Cyclists, which continues to organise protests in the wake of deaths. I've also mentioned the national organisations CTC and CycleNation coming round to a similar agenda, the Cycling Embassy of Great Britain, founded to promote that agenda nationally. In addition there has been significant support from the mainstream press, particularly the Evening Standard, which has adopted a very pro-cycling tone in recent years and been a strong supporter or the new Superhighways, and The Times, with its Cities fit For cycling campaign. During the period I have covered social media became very significant in enabling the rapid organisation of protests, drawing in people who would not have been part of paid-up organisations. All these movements and opinion-formers, including the blogs and other social media, have supported each other in enabling the changes we are now seeing, but that the people at the centre, the existing and organised cyclists in London, decided exactly what they wanted to see, and decided to act on it, has, in my view, been decisive. The challenge now is to broaden the base of support massively; we need to get not only existing cyclists, but parents, teachers, academics, religious leaders, trade unions, mother' unions, old peoples' organisations, neighbourhood groups, amenity groups, disabled groups, and so on, on our side. CyclingWorks did a tremendous job getting businesses on our side, and that's a model that needs to be extended and followed up in other ways, particularly as the infrastructure starts to extend further out into the suburbs, where the views of employers become less important, but those of other groups more so. In many ways our democratic process is broken, and broken into many pieces in London, with so many bodies having authority, and the ability to block change in certain areas. Some of this we cannot overcome now, but we can sometimes use this fragmentation to our advantage. There are always lots of people to whom we can appeal, who potentially have influence. If the councillors won't co-operate, one can try appealing to local MPs. If they are not interested, the London Assembly Members might well be, or even MEPs. It is possible to contact the Cycling Commissioner, and though Boris himself can be difficult to get hold of, he has various deputy mayors and assistants. There are usually potential points of pressure, and if you only have the Green Assembly Members on your side, you probably wont get very far, though they may make some noise. On the other hand, a broader alliance involving politicians and officials in different bodies and from different political or practical backgrounds might well provide the critical mass to move things forward. "The argument your city is not like #Amsterdam is invalid. Neither was Amsterdam." Change takes work. A relevant tweet from @TodUrbanWORKS, right-hand photo by Thomas Schlijper; note, in passing, how successful here was the conversion two-way to one-way flow for motor vehicles, while many in London currently advocate the reverse, rather than reallocating more space to sustainable modes. Ask for big enough changes to make an obvious difference to the environment for everyone. Try to find out what best practice is, ask for that, and keep asking for it at all stages of the lobbying and negotiation process. What you get will probably be compromised, but if the starting point was good enough, the final result will be good enough to make a difference. Don't be under-ambitious or think "We'll never be given that". Note, for example, how the solution for the intersection of the East-West and North-South Superhighways at Blackfriars that the Mayor went for actually turned out to be more ambitions than any campaigner had asked for. The things you are compromised down to in the end are capable of improvement later, when the climate of opinion has improved, as with the widening Camden cycle tracks. You have to take account how all the other transport modes and legitimate business and residential activities on the road are going to operate. There is no point crusading for a solution which is going to be widely unacceptable. You have to develop the ability to distinguish between the visionary, which is eminently practical and can prove popular once a certain conservatism has been overcome, and extreme, impractical and fundamentally unpopular solutions that will be perceived as anti-car, anti-choice, anti-business, or anti-pleasure. Once you have a valid, practical and saleable solution, all objections should be analysed, questioned and shown to be weak or groundless. The variety of these is never-ending, and more will always be invented, from golf balls to bombs, but these can be shown up as mere irrational resistance to change, and most people have the good sense to be able to see this. The public can be trusted perhaps more than you think. Don't dismiss any population, anywhere, however it may appear from the outside, as being 'irredeemably wedded to the car'. 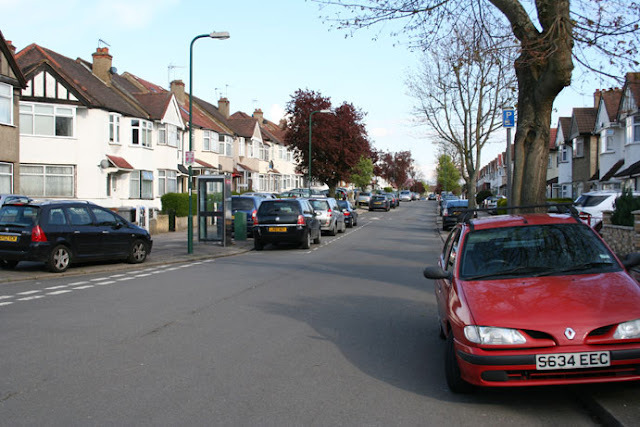 Scratch the surface, and you find the most car-oriented people generally would like to be able to cycle their children to school, and they'd like their granny to be able to cycle to the shops like she used to, if they can see a feasible way of doing it. Officials tend to want to keep doing the same things they have always done. Though nothing is actually telling them they cannot do what you are asking, they will invent reasons why it can't be done. Appeal to politicians at all levels and in all parties to make the officials work for them, as they are supposed to do, and not dictate their own agenda. I loved every one of them (even the dispatch riders). Sobbing by a blue cycle post in Mayfair, it was like Mandela walking free all over again.